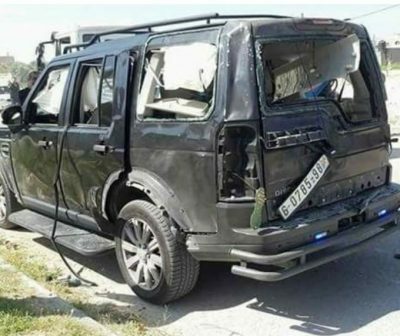 Palestinian Prime Minister, Dr. Rami Hamdallah, and Palestinian Intelligence Chief Majed Faraj, have survived an assassination attempt, Tuesday, while seven guards were injured, after explosions targeted their convoy, just as they entered the Gaza Strip through Beit Hanoun (Erez) Terminal. Both Hamdallah and Faraj were in a convoy of vehicles when three wired cars exploded just as they passed by them, causing damage, before gunmen exchanged fire with the bodyguards, mildly wounding seven of them. Commenting on the assassination attempt, Hamdallah said that what happened will only push for boosting all efforts aimed at serving the Gaza Strip, and ending the internal divisions. Although Hamdallah and Faraj left the Gaza after participating in the opening ceremony of a water desalination plant, after the explosions took place, they said that they would be back, and intend continue their efforts to maintain unity, and implement more projects that would help the improvised coastal region. It is worth mentioning that Lieutenant Faraj indirectly held Hamas responsible for the assassination attempt, and said the movement is currently the only party that oversees security in Gaza. He also described the incident as cowardice and aimed at sabotaging national unity. Palestinian President’s office held Hamas responsible for the attack, as it is currently solely in charge of security in Gaza, and said that this incident is meant to foil the attempts to achieve comprehensive reconciliation and unity. Adnan Dmeiri, the spokesperson of Palestinian Security Services in the West Bank also held Hamas responsible for the attack and said that this serious incident targets the unity of the Palestinian people and all reconciliation efforts. Furthermore, Azzam al-Ahmad, a member of the Central Committee of Fateh movement said that President Abbas, who is currently visiting King Abdullah of Jordan, has decided to return to the West Bank. Al-Ahmad also held Hamas responsible for the attack, and demanded the movement to relinquish all responsibilities, including security, to the unity government, in addition to calling on the Egyptian security delegation, currently visiting Gaza, to clearly name the parties that are obstructing national unity and reconciliation. It is worth mentioning that the Egyptian security delegation said it won’t leave Gaza, and will continue its efforts to help the Palestinians achieve national unity and security. Meanwhile, Hamas movement rejected what it called the “readily available accusations” and denied having any connection to the attack. Spokesperson of the Hamas-run authority in Gaza, Fawzi Barhoum, said that Hamas strongly condemns the explosions and assassination attempt, and considers what happened as a crime targeting the Palestinian people, and an attempt to create serious tension. He added that the Interior Ministry, and the National Security devices, are investigating all circumstances of the attack. Nafeth Azzam, a senior political leader of the Islamic Jihad, issued a strong condemnation of the attack, and told the Palestinian Radio that Hamdallah’s visit to Gaza serves the interests of all factions in Gaza, including Hamas and the Islamic Jihad. Azzam called on all parties in Gaza to unite, and protect the interests of the Palestinian people. 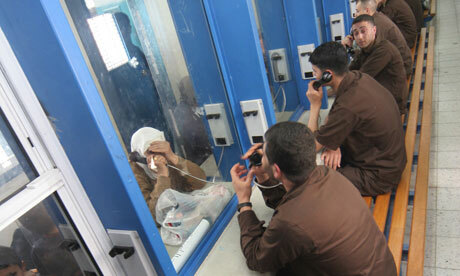 The Legal Center for Arab Minority Rights in Israel, Adalah, issued a statement Tuesday contending that Israeli prison authorities have refused to provide heat, blankets, warm clothing to Palestinian prisoners that they are holding without charges in Israeli prisons..
Adalah initially sent a letter on March 4 to IPS Commissioner Ofra Klinger and Israeli Prison Service (IPS) legal advisor attorney Yochi Gensin demanding that they provide blankets to Palestinians classified as “security prisoners,” refrain from limiting the number of blankets an individual may use, and allow heaters in cells. Adalah also demanded the IPS allow families to bring blankets for the prisoners and that it cancel orders that allow the confiscation of blankets as a punitive measure. According to Adalah’s press release, recent testimony received by the rights organization from imprisoned individuals illustrates the harsh living conditions and severe cold faced in IPS prisons. 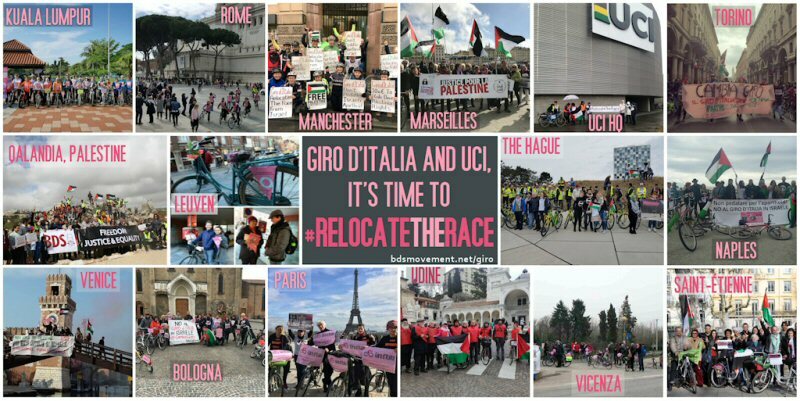 Cyclists and supporters of Palestinian human rights took to the streets in 20 citiesacross the world on Saturday, March 10, 2018 for the #RelocateTheRace International Day of Action. 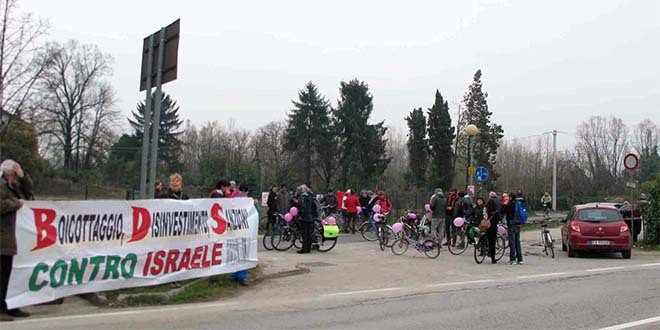 Bike rallies and actions called on Union Cycliste Internationale (UCI), the governing body of cycling to relocate the start of the famed Giro d’Italia cycling event, set for May 4 in Jerusalem. 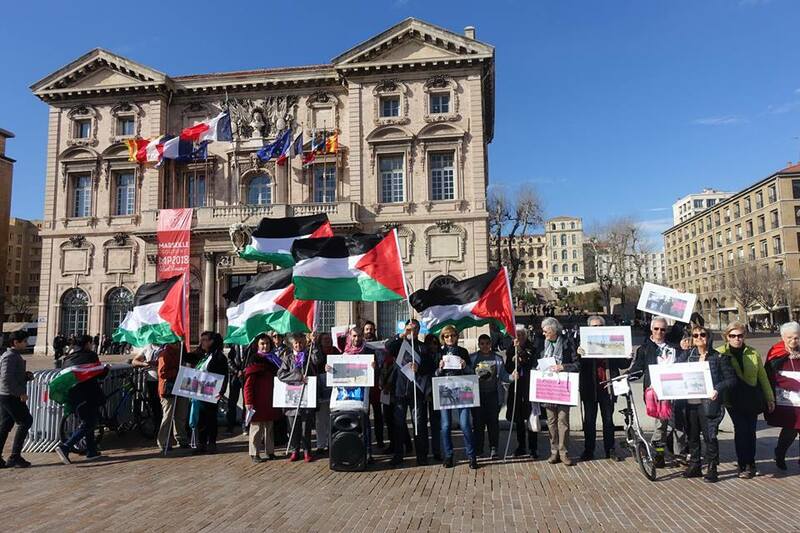 Participants highlighted Israel’s denial of Palestinian rights, including freedom of movement, and its use of the race to sport-wash its regime of occupation and apartheid. 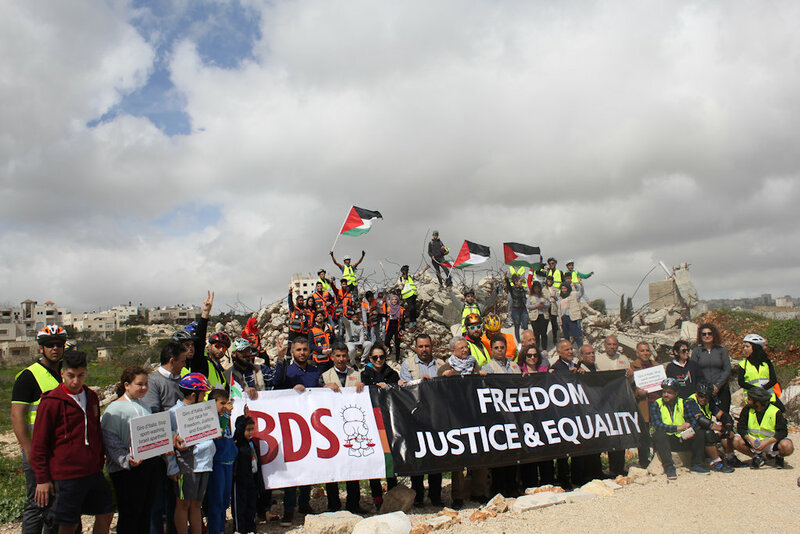 The day of action started in Palestine, with dozens of young Palestinian men and women participating in a “Counter Giro” race in the occupied West Bank from Ramallah to Qalandia, a locality confined by Israel’s apartheid wall and military checkpoints. The race was part of the events for Israeli Apartheid Week and highlighted Israel’s ongoing destruction of Palestinian homes and farms. Qalandia, remains of a Palestinian home demolished by Israel. In 2016, Israel demolished 33 homes in this village alone. In Switzerland, cyclists pedaled to UCI headquarters in Aigle. Despite numerous letters and appeals to move the race start, citing UCI’s own ethics code, the organization has failed to take action to prevent professional cycling from being complicit in Israel’s violations of international law. 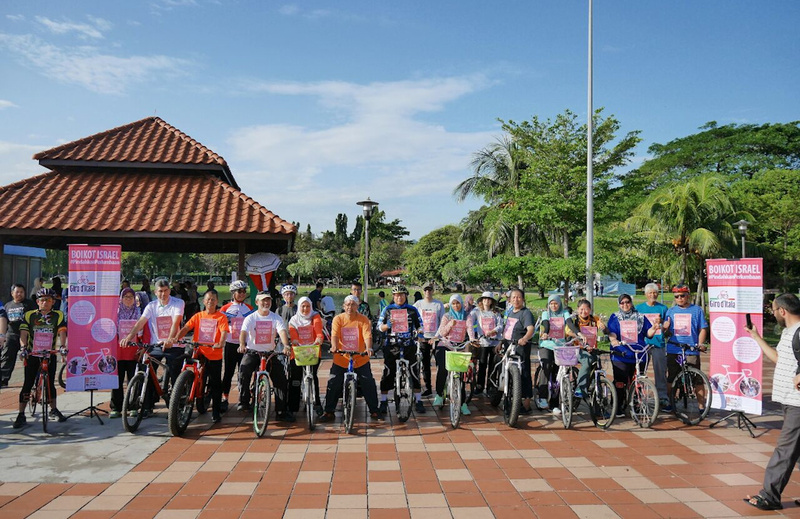 In Kuala Lumpur, more than 50 people, young and old, individuals and families, students and cyclists, gathered on Saturday morning to call on the Malaysian Cycling Federation, a UCI board member, to take steps to ensure UCI relocates the race. Protests were held in more than 10 cities across Italy. In Rome, dozens of cyclists gathered for a parody award ceremony near the Colosseum, where the Giro d’Italia finish line will be. Italian electric utility ENEL was “honored” as Best Sponsor of Israeli Apartheid. UCI was given the Ostrich Award for keeping its head in the sand. Giro organizers, who received a reported 10 million euro from Israel, were honored as Best Profiteers From Human Rights Violations. The Israeli cycling team was honored for Best Cycling Cover-up of Israeli Crimes. 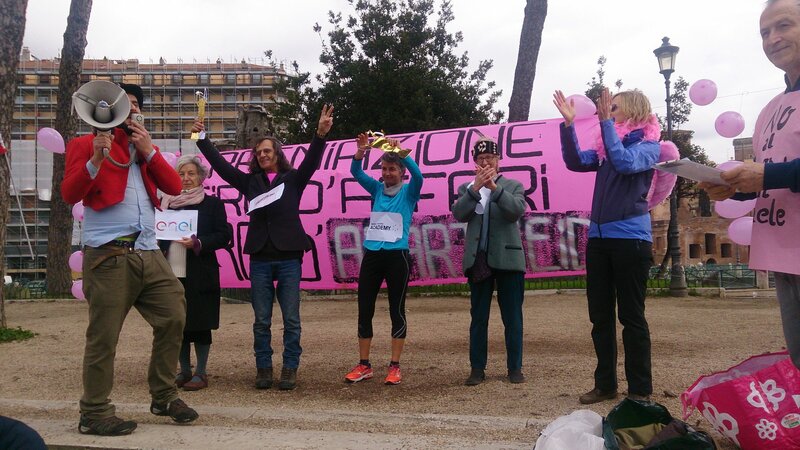 In Sicily, activists held a public assembly in Catania to prepare for protests at the Giro d’Italia. The first Italian stages of the race will be on the island. Bike rallies were also held in Bologna, Milan, Naples, Ravenna, Torino, Udine, Vicenza and Venice. 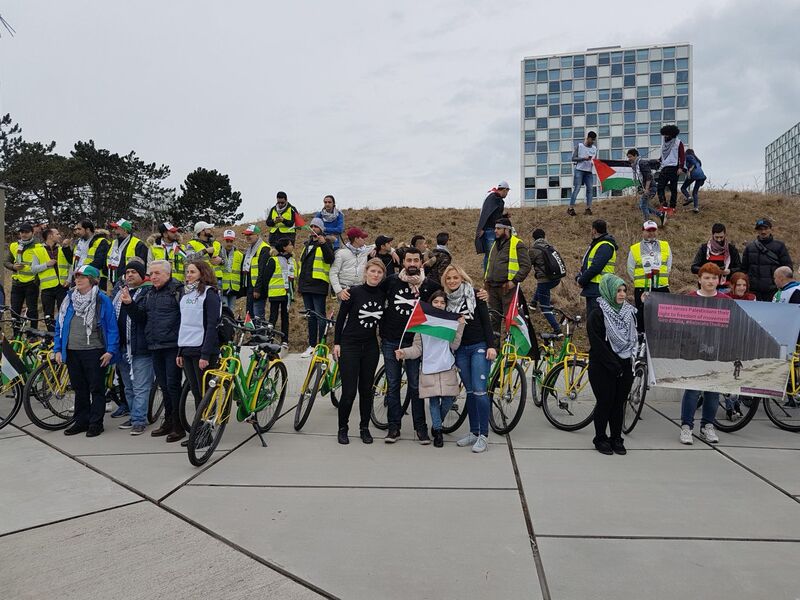 In the Netherlands, roughly 80 cyclists participated in an “Alternative Giro” in The Hague, pedaling from Parliament past the Peace Palace and the International Criminal Court, noting Israel’s long record of war crimes and human rights violations. 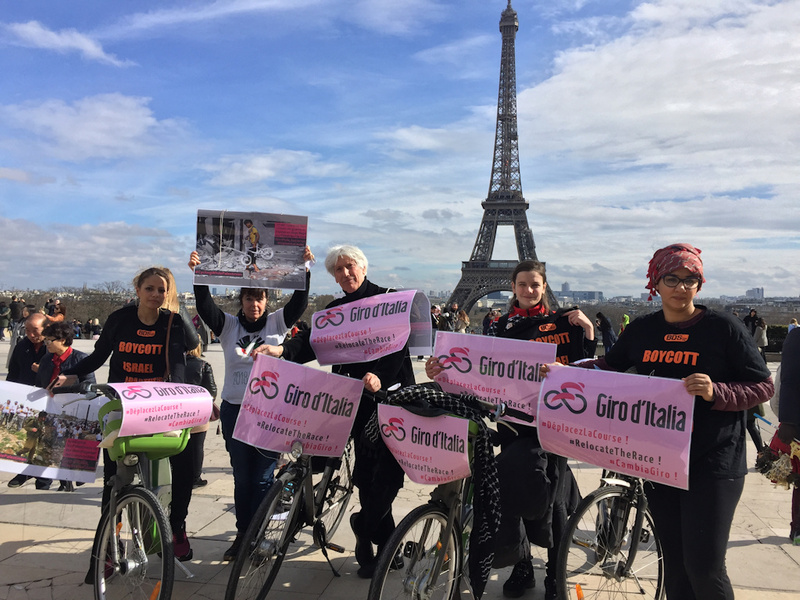 In France, cyclists in Paris rode from the Tour Eiffel to French Giro broadcaster L’Equipe. Bike rallies were also held in Saint-Étienne and in Marseilles, where activists distributed over 1500 leaflets. 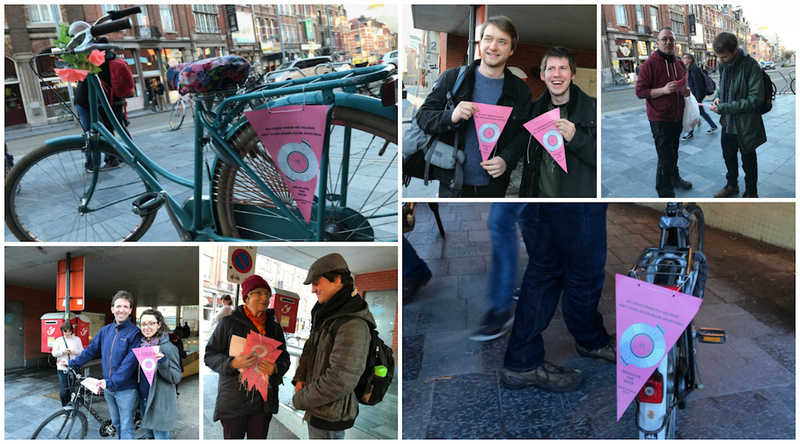 In Belgium, activists in Leuven distributed bike flags reading “Ride for peace and freedom, not for Israeli apartheid” to an incredibly responsive public, who objected to the abuse of cycling to hide Israel’s human rights abuses. Israel has long borrowed from the playbook of the apartheid regime in South Africa, using sports to mask its decades-long military occupation and apartheid regime. 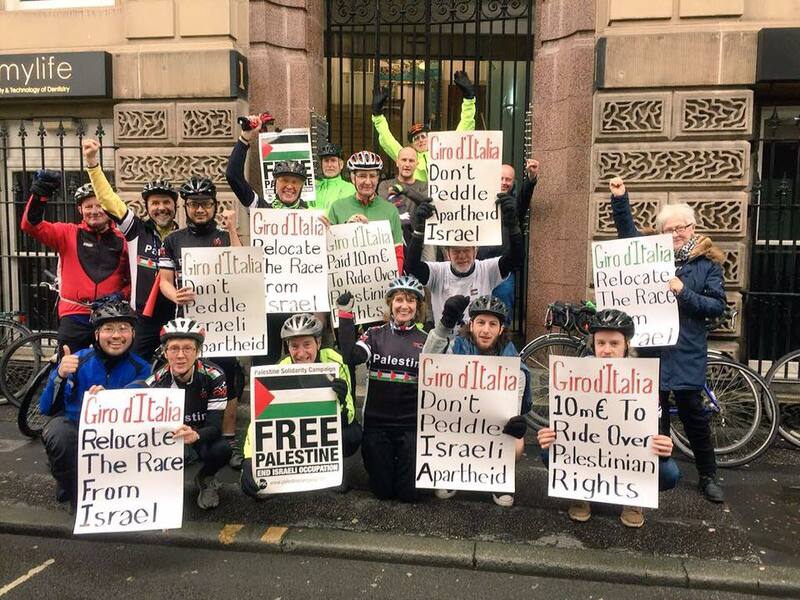 Supporters of Palestinian rights around the world are committed to continue pressuring professional cycling until it ends its partnership with the Israeli government, allowing one of cycling’s top races to be exploited for political means. Gaza has seen several clashes since the announcement of US President Donald Trump recognising Jerusalem as the capital of Israel, with protests planned every week. Last month, two Palestinian teens were killed after being shot with live ammunition as they approached the perimeter fence, reportedly in search of work in Israel. ths, confronted with an energy, water and healthcare crisis. Residents have also been prevented from leaving the Strip, forcing a young Gazan girl to travel without either of her parents to the central occupied West Bank city of Ramallah yesterday in order to have a kidney transplant last month. A recent report also found that more than 1,000 Palestinians have died as a result of the ongoing 11-year Israeli siege imposed on the besieged enclave. Arab Parliament Speaker, Mashaal bin Fahm Al-Salami, called on parliaments around the world to urge their governments to support the United Nations Relief and Works Agency for Palestine Refugees (UNRWA) so that it continues its work in accordance with UN General Assembly Resolution 302. Al-Salami said in a statement that he had sent letters to a number of world parliaments that have always supported UNRWA such as: the United Kingdom, France, Italy, Spain, Japan, the Netherlands, Germany, Belgium, Australia, Switzerland, Canada, Denmark and Norway. Al-Salami praised in his letters the countries support to UNRWA, stressing that the Arab Parliament rejects attempts to politicise the humanitarian role played by UNRWA after the US froze part of its contribution to the agency’s budget. Al-Salami stressed that UNRWA work should only end after the implementation of UN General Assembly Resolution 194, which called for the return of the Palestinian refugees and compensation for those who have been displaced from their homes. Al-Salami also thanked the Arab countries, which are among the top 20 countries that support UNRWA. In its latest report, the Palestine Liberation Organization’s National Bureau for the Defense of Land and Resisting Settlements has covered plans by the Israeli government to continue its Judaization policy in Jerusalem and Hebron, including grants for settlement outposts. This silent ethnic cleansing policy also incorporates the approval of an amendment to the so-called “Entry into Israel” law, which allows the Israeli Interior Minister to withdraw or revoke the status of a “permanent resident” due to perceived lack of loyalty. According to the report, the decision by US President Donald Trump to recognize Jerusalem as the capital of the State of Israel has given Israeli policy makers free rein to specifically target Palestinian Jerusalemites and West Bank citizens. Recently uncovered settlement plans by Israeli NGO Peace Now have have coordinated the expulsion of Jerusalemites and demolition of Palestinian homes to be replaced by settlement housing units. Similar violations of Palestinian rights to their land have occurred under the cooperation between the Israeli occupation authorities’ Ministry of Justice and settlement organisations, which has seen the displacement of Palestinian families in order to resettle Jews in Arab neighbourhoods. Hananel Gurfinkel was appointed as “Public Trustee” for the “East Jerusalem File” and also set up an association working to prevent what he called “foreign entities from controlling state property in East Jerusalem.” He is also responsible for a series of evictions of Palestinian families and handing over their homes to right-wing settlement groups. Although the majority of properties abandoned in 1948 belonged to Palestinian Arabs, Palestinians have been denied ownership to their property while Israeli law allows Jews to possess the property. The policy of Judaization and silent ethnic cleansing is not limited to Jerusalem, but also extends to Hebron. The establishment of 4 new caravans in the Bouira area was authorized near the so-called “Kharsina” settlement, built on the land belonging to Palestinian citizens. Similarly, a new report issued by UN OCHA, showed that the area known as H2, once known to be bustling and prosperous, has now been transformed into a “ghost town,” amidst fears of the displacement of its 40,000 people in favor of a few hundreds of settlers. The report also tackles the amount of humanitarian and material damages suffered by the Palestinians. The report stresses that the policies and practices carried out by the occupation authorities under a “security pretext” have affected the lives of Palestinians, to the extent where they are harassed by settlers and scrutinized at military checkpoints. In a campaign called “embrace the bear”, the occupation army recently began to collect information from Palestinians throughout the West Bank’s checkpoints via security forms, to find out where they work, where they live and other details, as well as a picture of their personal identity. Settler assaults have also had a severe impact on Palestinian livelihoods with agricultural land bulldozed in multiple cities. Hebron saw large areas of its land in Yatta, yielding winter crops, bulldozed, as did the Al-Farseiah area in the northern Jordan Valley. In Qalqilia farmers have been prevented by Israeli soldiers from entering their agricultural farmland behind the Apartheid Wall west of the town to work and plough, whilst in Jenin people of the Al-Mukhal area were prevented from reaching their homes and farms. At least eight Palestinians were injured, one of them seriously, during clashes with Israeli occupation forces on Monday afternoon at the northern entrance to al-Bireh city. The clashes broke out following a student march protesting the arrest of Omar al-Kiswani, the president of the student union at Birzeit University who was arrested by Israeli undercover soldiers in the university campus on Wednesday. 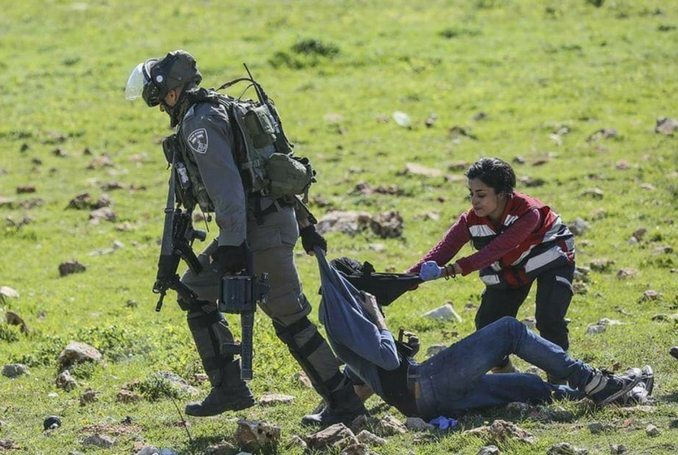 The Israeli soldiers assaulted the ambulance crews and prevented them from providing first aid to the injured.